Mike Mandarano has received two corneal transplants. 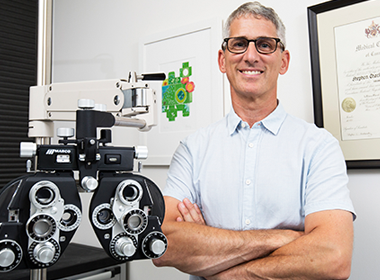 Mike Mandarano understands the importance of the Misericordia Eye Bank. 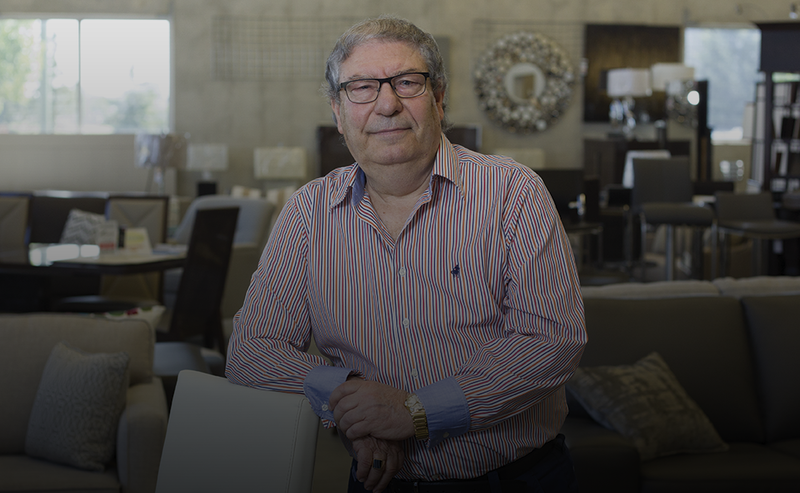 Seven times in the last 15 years, the co-owner of Contessa Fine Furniture has suffered severe vision loss due to corneal swelling. And each time, he has had his sight restored by way of corneal transplants made possible by donations to the eye bank. That experience has left Mandarano filled with gratitude for all the people who have donated their corneas to the eye bank. It has also inspired him to return the favour. "I've signed up to be an organ donor," he says. "When my time comes, I want to be able to help others." The tale of Mandarano's multiple corneal transplants begins in 2002 when he started to experience trouble in his left eye. At that time, he was diagnosed with severe glaucoma, and surgery was performed to correct the problem. As a consequence of that surgery, however, Mandarano's cornea became severely swollen, a condition that can cause dramatic loss of vision. Fortunately, he was able to undergo a corneal transplant to correct that problem as well. But that would not be the end of Mandarano's eye troubles. Since the initial corneal transplant, he has had a total of six others to correct problems with his vision in both eyes - the latest operation taking place in March of this year. Mandarano says he felt strangely calm while preparing for that operation, most likely owing to the fact that he has gone through the procedure successfully before. "I know I should have been scared to go through this operation, but I felt like I was in the right hands with my surgeon," says Mandarano. "My doctor made me feel so comfortable. I can't say enough good things about him and the work he did on my eyes." The doctor in question was Dr. Stephen Brodovsky, who also happens to be the Medical Director of the eye bank and an assistant professor in the Department of Opthalmology at University of Manitoba. As he explains, while cases like Mandarano's are rare, corneal transplants are fairly common in Winnipeg. In fact, as many as 100 Manitobans receive the gift of sight through corneal transplants performed at the Misericordia Health Centre every year. These transplants are made possible by the 120 Manitobans, on average, who make cornea donations each year. Still, officials with the eye bank say they would like to see more Manitobans sign up to be donors. As Brodovsky explains, transplants can only be done when donated corneas become available, and the average wait time for a transplant is one year. 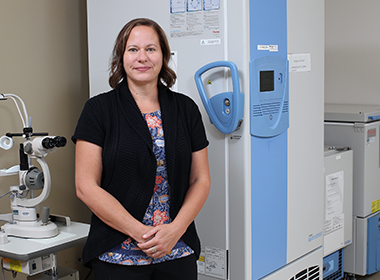 "When a cornea is donated, we have a two-week window to use it," says Brodovsky, adding there are six surgeons in Winnipeg and Brandon who perform corneal transplants. "We do the transplant as soon as we can once the tissue has been cleared for use." "When a cornea is donated, we have a two week window to use it." In comparison, a transplant program in Toronto would be doing thousands of corneal transplants a year, according to Kelly Burnell, senior technician at the Misericordia Eye Bank. "A place like Toronto would see much higher numbers, due to the higher numbers of people signing up as eye donors," she says, adding it would be wonderful if more Manitobans registered to become eye and other organ donors. Ten to 20 years ago, all transplant patients underwent a procedure called penetrating keratoplasty, where their cornea was removed, and the donated cornea was inserted in its place. This took 16 to 24 stitches to complete. "That was the only transplant technique taught when I trained," says Brodovsky, adding the layered technique used today has revolutionized corneal surgery. Today, the majority of corneal transplants involve surgery to replace the inner layer by a technique called Descemet's Stripping Automated Endothelial Keratoplasty (DSAEK). During the procedure, a surgeon will make a four-mm incision and insert a little wafer of corneal tissue that includes the endothelial cells. "The new donor cornea is placed into the recipient's eye beneath their own cornea. It is then held in position by injecting an air bubble inside the eye beneath the new cornea," says Brodovsky. Patients today also recover more quickly. "I saw a gentleman today, who had surgery just a week earlier," says Brodovsky. "He's already seeing better. Under the old system, it might have taken him six to eight months to see, and he would have had a lot of astigmatism or irregularity." Brodovsky says about 70 per cent of transplants are done using this technique, and the majority of cases are due to failure of the inner corneal layer (endothelium) due to previous eye surgery (for cataracts glaucoma or retinal diseases) or Fuch's dystrophy, an inherited condition caused by a degeneration of the endothelial layer of the cornea. The other 20 to 30 per cent of transplants are performed for patients that have a corneal scar from trauma or an infection (often due to contact lens wear). There is also a disease called keratoconus, a thinning disorder of the cornea that usually affects people in their late teens or 20s. Manitobans could become donors to the eye bank. The surgery for these diseases is called deep anterior lamellar keratoplasty (DALK), which preserves part of the patient's own cornea. "Today, our techniques are much more selective. We can replace the particular layer of the eye that is needed," he says. But it all comes back to having the corneas available to transplant. When a call comes in to the eye bank, part of Burnell's job involves assessing corneas for donation. The average person is born with 3,500 to 4,000 endothelial cells in their cornea, which are lost gradually over time. "The criteria for accepting a donation is when that cell count is 2,200 or higher," she says, adding that technicians use a computerized microscope to determine that count. The eye bank also preserves amniotic membrane, which is used in the treatment of several ophthalmic conditions, especially those related to the ocular surface. The amnion comes from women having a planned Caesarian-section. On average, only one donation is needed per year. Keeping people from losing their vision is the reason why the eye bank staff does what they do, says Burnell. "Our job isn't glamourous," she says. "But then you look at the amount of good it does for someone who can't see. The donor is making a big difference: helping another person see again." 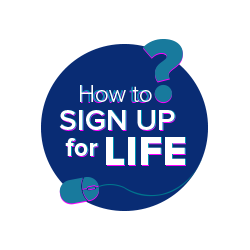 Back to "Sign up for life"